karaikudi's second battalion is inaugurated in Amaravathipudur located in devakottai road.Already there is battalion in college road karaikudi.This new battalion would support the CISF to tackle the naxalites.since the arakoanam cisf was converted to NDRF karaikudi got CISF.Thanks to the government for choosing karaikudi.karaikudi people are expecting many more developmental projects like this. The Extract from "THE HINDU"
"The nation was facing a perennial threat from naxalites and other extremist groups," said Union Home Minister Sushilkumar Shinde on Sunday, after inaugurating the 4th Reserve Battalion campus of the Central Industrial Security Force (CISF) at Amaravathipudur near Karaikudi. 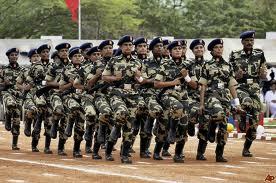 CISF was deployed in large numbers in Maoist-affected States to tackle the naxalites, he added. Mr. Shinde said the state-of-the-art campus would provide an ideal setting for the force to further hone its skills and enhance its reputation. He said since the CISF Reserve Battalion located at Arakkonam was converted into a National Disaster Response Force (NDRF) battalion, it had become imperative to establish a reserve battalion in the southern part of the country. Amaravathipudur near Karaikudi was ideally located to cater to the internal security requirements of both Tamil Nadu and Kerala, he said adding that in case of any emergent requirement, the contingent would reach the spot in no time. He thanked his colleague and Finance Minister P. Chidambaram for taking the initiative to provide 100 acres of land to the CISF Reserve Battalion. The campus will have complete infrastructure, including administrative building, quarter guard, officers’ mess, stadium and gym. Accommodation facilities for 520 families would be constructed, he added. He said part of the electricity required for the battalion would be met from solar power and the layout of the complex had been designed in Chettinad style of architecture to maintain harmony with local surroundings. The Ministry of Home Affairs has sanctioned Rs. 100 crore to build the facilities in the campus.